Please note Christmas Tree Orders must be placed by December 20th 2015. 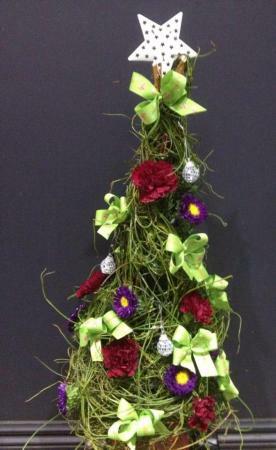 Amaranthine Flowers By Design offers a unique range of Christmas trees. Each tree is different and designed in store. They look gorgeous on a table or counter or as a unique gift for family and friends. With a choice in colours and styles these make a wonderful gift for Christmas (premium version is pictured). Long lasting flowers and foliages are used. The Amaranthine Dodda Christmas tree is eye catching and brings colour and life to any room.